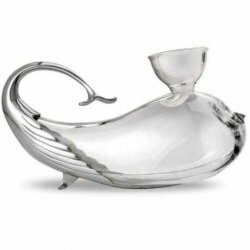 Wine decanter shaped like a whale. The decanter is made of pewter and European glass. The whale's tail curves over the decanter, and functions as a handle. The decanter comes with a funnel that helps sieve and aerate the wine. The wine is poured out of the whale's mouth, and is poured into the decanter through the whale's blowhole. This decanter would certainly serve as an excellent conversation piece during your next dinner party!